Team Hawkins welcomed Xavier Byrne and Dylan Fleischer back into the lineup. The game started well with our experienced midfield trio of Angus Moten, Harvey King and Hudson Savage clearing the centre and getting the ball into the forward line for Shane Zhang to score within the first minute. It was a portent of things to come, as the Cats dominated the play for the remainder of the match. Team Hawkins had been challenged by the coaches last week and at training to improve their concentration, and it was clear from the centre bounce that the boys had accepted that challenge. They were hard at the ball and their opponent, and the link up from defence to centre to forwards was perhaps the best we’ve seen. Ryan Clancy and Hudson continued their dominance with the ball in the centre and clearing defensive kicks, and scored two goals each when rotated forward. Xavier also scored a major in the 3rd quarter. In the final term Noah Tops kicked a booming goal from just inside the forward zone, and Jude Lumley (wearing number 23) channelled Lance Franklin to run and bounce away from his opponent and score from the pocket. Other notable efforts include Thomas Bredenhann, who shook off a nasty hard and high tackle to lay the very next tackle himself, Henry and Noah who were always at the play, and Angus and Harvey who didn’t stop tackling in the midfield. It was a complete and mature all-round effort from Team Hawkins, and very pleasing for coaches, parents and the team themselves. They deserved the win. It was a physical game against the Pittwater Tigers today, not the least we had 9 girls covering a large oval so there was plenty of running from end to end. They may have been a larger side, but we were first to the ball and faster to find a team mate close by. There was some pushing and shoving during game, but I was proud of how we played the ball with great effect. The score today reflected the way we played as a team, looking for a player in a better position when we had the ball and applying pressure on the ball carrier when we didn’t. Lily S, todays captain, chose to run with the wind in the first quarter. Their midfield started well moving the ball well into our defensive line, but like last week, Charlie D, Elin L and Lizzy Y, repelled every attack sending the ball back down field. Our forward line of Jeanie N, Maia K, and Grace O, worked well to keep the ball in our 50m arc, with Grace being rewarded with the teams first Goal. In the second quarter running into the wind, we kept a similar structure with a goal to Lily S and no goals to Pittwater we went into the half time break tired and weary but happy with our efforts to this point. The oranges were well appreciated and needed. In the second half we mixed the positions up moving Charlie D and Elin L forward, both had shots on goal Charlie D scoring one and Elin L preferring to kick towards the soccer goal adjacent to the posts. Grace O was tenacious in the middle of the ground and Lizzy Y had showed no signs of the knock to the head, tackling her much bigger opponents. Jeanie N provided great support to her team, shepherding an opponent to allow a kick down field. Sami Z tried hard all day, scored a goal in the last quarter and was a threat throughout the game. Eliza M was all class in the middle, kicking strongly and always finding a team mate down field. Lily S ran all game and as captain set a fine example for everyone to follow, and lastly Maia, nearly kicked a second goal for the year, and I am sure the Pittwater team won’t forget our number 10, for a long time. Happy Easter everyone enjoy your break. I will be at training on Wednesday 17th for a low key goal kicking practice session that might involve easter eggs 🙂 No training the week after. Low on numbers due to the school holidays, but high on confidence, Team McWilliams took on the highly fancied St Ives Saints. St Ives got off to a bright start with a couple of early goals while the Cats steadily worked themselves into the game and although not troubling the scorer in the first quarter, put up a game fight. In the second and third quarters, against a tall, skilful and fast team, the Cats played some of the best footy we’ve seen from them. Particularly pleasing were the second, third and fourth efforts in both attack and defence and the shepherding and quick handballs that allowed the team to gain possession and move the ball into the forward line. At three quarter time, while still behind on the scoreboard, Avishi had kicked the first and second goals of her AFL career and Tipsy had punted one in from the half forward line. Jaime, Charli and Burna all stood out for their repeated efforts. Unfortunately, by the last quarter, the effort had told and St Ives kicked away and the scoreboard flattered the winners. A lesson for our girls in playing the game out to the end. Final scores – St Ives Saints 14-15-99 d Lane Cove Cats 3-1-19. Goal Scorers – Katmaneni & Halloran. Player’s Player – Griebel & Morelli. On another lovely Sunday afternoon we turned up to play Easts. Down 3 boys we were lucky enough to get Jude, Noah and Bryce from the U11s. We were expecting a tough game from Easts after they had inflicted the mercy rule on Hornsby last week and it was evident from the start that they had turned up to play. The boys work rate in the first half was excellent with only a few points in it at half time, what was even more exciting was that our boys started to follow the game plan that had been laid out to them. We ran the ball well out of defence, playing together to get the ball out and along the wing, to where we switched inside, kicked into an open forward line and scored. The tackling was ferocious from all, however in the third term Easts got the better of us, and with boys getting tired, Easts blew the margin out to 24 points at the three quarter break. Although we tried hard in the fourth the damage was done and in the end we lost by 31. What I am most proud of was how even the effort was from all boys, the two Sam’s are in their first year of AFL and we had 3 from the U11s, everyone worked so hard as a team. As I said to the boys after the game, of course we would like to be winning the games, but at the moment I am very happy for them to be playing to the game plan we set out and working as a team.We have a whole season a head of us! There will be no training for the next 2 weeks, the next game is on the 28th April. Would everyone please update Team App as soon as possible as to their availability. I will be away on the 28th and Tony Schultz will be the coach for that day. I wish everyone the happiest of Easters and please keep safe. It took a while, but after playing a game of Where’s “Zac”, we found him safe and sound.. The girls had the opportunity to ask questions, get some signed gear and take some photos. We really appreciate Zac taking the time to come and visit, everyone appreciated it! The U10 Dal Pos team had the perfect start to the season, withstanding a spirited effort from Forest Lions to come away with a victories smile. Under a scorching sun at Lionel Watts Reserve, the girls took some time to get into the game. This was unexpected, with half team playing their first ever AFL Sydney Junior competition game. The help get as many girls out onto the park, we had one Dal Pos girl play for the Forest Lions. And they seemed to have their best period with the opposition. Genevieve kicked a goal for the Lions in the second quarter. However, Tanya, who only joined the team a week ago, seemed to improve markedly within the game. She ended up having her best performance for the day with the Lions shirt on. What they lacked in cohesion in the early parts of the game, they made up for in effort. A missed kick or errant handball wasn’t fussed over. Instead they kept on charging for the ball. Forest had some tall girls and made use of this advantage by kicking the first goal through their aerial dominance. But Dal Pos came at them hard and never gave up. The girls didn’t shirk any challenges. This saw us have to utlise our magnificently stocked Coaches Bag during the game (thank you Jane Zahra!). Veronica sprained her wrist, but came back onto the ground to play a great game. We went into final term down a few points. However, they finally clicked as a team and had numerous forward entries. Genevieve and Chloe got on the end of these and kicked four goals to help get the Dal Pos girls over the line. We didn’t have the printer working this week so couldn’t hand out the game day awards. However, the following girls will receive the following awards at next week’s game. Courage Award – Veronica for spraining her wrist and returning play out the game after some ice. Spirit of the Game Award – Genevieve for playing for the opposition and kicking them a goal, and for swapping positions with team mates to ensure others got a turn to kick goals in the forwards. We also have a team mascot called Kit Kat. One lucky girl every week is given the responsibility of looking after her. This week it was Tanya Graham for her magnificent effort in playing for Forest Lions in her first ever AFL game. What team spirit! Our first game of 2019 was against the Leichhardt Cygnets, and it was an important reminder of how important it is to get your hands on the ball. The first quarter was dominated by the Cygnets, and had they been more accurate with their shots on goal, they would have ended the quarter well in front. Their dominance was founded on the simple fact that their midfielders and forwards were first to the ball. After a bit of a quarter time chat, the game changed. The Cockatoos stopped being the chasers and started being the chased, as our mid-fielders and forwards were first to the ball, and our defenders marked and pressured their opponents. Jerry was relentless getting his hands on the ball time and time again and passing to a team mate and getting it forward. This resulted in 3 goals in a quarter to Ryan to put the game squarely on our terms. As the game progressed we started to link up between the defenders, midfielders and forwards, this was best exemplified by a passage of play in the third quarter, which saw Jonti in the defensive zone take an intercept mark at full gallop, play on kicking the ball through the mid-field into the forward zone, where it was roved by Ivan, who used his strength to break through the defenders and hand pass over the top to Hamish, for the first of his two goals for the quarter. Ivan’s ability to get to the ball, and get it to his team-mates was indispensable, and his work rate resulted in a number of our goals. Our first time players, Jack and Ben got plenty of the football, and used their great tackling skills to put pressure on their opposition and win the ball for the Cockatoos. Oscar was his usual tenacious self, picking up from where he left off last year, kicking his first goal for the year, and leading the tackle count as he chased and harried his opponents. Ollie’s speed and roving ability meant he regularly got his hands on the ball, and Aza’s pressure backed up his team-mates brilliantly, and he was unlucky to miss out on a goal as his kick fell just short. Jude did well using his size and strength, and Jonti once again led the marking stats, as well as kicking a long range goal from a tight angle. All in all it was a great start to the season. I’m looking forward to watching these boys improve and come together as a team during the course of the season. Next week we play our first home game at Blackman Park against the Willoughby Wildcats, with kick-off at 8 am. Can’t wait for the next game!! With an extra hour in the day and beautiful sunshine at Lionel Watts Oval, there were no excuses in missing our late 15:45 start time today. It was a bit of an unknown for everyone today, new team combinations on the field, and a parent cheer squad that had been missing the opportunity to exercise their lung capacity over the summer. Neither of these disappointed. The game started as a tight affair, with the Cats midfield of Lily S, Lizzy Y, Eliza M and Sami Z clearly enjoying the freedom on no zones and the ability to tackle their opponent freely. The Forest Lions team was strong initially winning the ball out of the centre and threatening our defence of Charlie D, Elin L and Genevieve H on multiple occasions. The ball continually hit a break wall though and was returned efficiently every time. The most pleasing part of the 1st quarter was the way our forward line worked together and held the ball inside the 50m arc. Jeanie N, Grace O, and Maia K ran tirelessly providing options and defended strongly when Forest had the ball. Eliza M took a great mark in front of goal and kicked truely to score the teams first goal and this was followed by Maia, sneaking out the back and getting our second. The whole team looked fast and agile as the quarter went on in the hot afternoon. This is a great example of what a strong pre-season training can do for the team. At the quarter time break I am sure I saw Genevieve, Elin and Charlie building a wall in the sand pit covering the cricket pitch in the middle, because in the second quarter Forest Lions only managed a point and at half time we were ahead 5-1-31 to 0-1-1. Lily continued to run strongly and was rewarded with a strong goal in the quarter. Sami scored the first of her 5 goals for the match and Lizzy chimed in for a goal as well. In the second half, we changed the team around and importantly this had no impact on the teams performance which continued to excel. Grace was everywhere in the middle and courageously tackled everything in her path. Finally a big thanks to Genevieve for playing up and filling in! The season kicked off in splendid sunshine at Blackman Park as Team McWilliams faced the Canada Bay Cannons in a pretty evenly matched U14 Youth Girls game. The game opened brightly as the Cats dominated possession in the first three quarters. 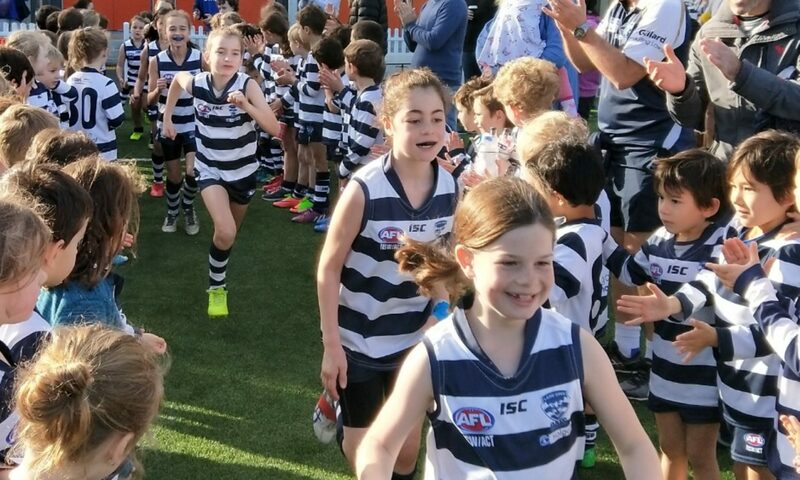 Jaimie, Bronte and Natalie all made their debut with the Cats with strong games, and AFL debutant, Avishi, held down the full forward spot with determined attack on the ball. After being 3 goals down at half time, the Cats had fought back in the third quarter to be 2 points down at the break and as fatigue was starting to set in, it was clear that we were in for a grandstand finish. In the final quarter, a tight struggle for the first ten minutes meant neither team bothered the scorer, but with three minutes to go the Cannons slotted the heart breaker and the game was as good as over. The Cats can be very proud of the way that they ran out the game. Everybody was strong at the ball and there was plenty of ferocious defence from both sides. Kicking, handballing and general awareness has significantly improved from last season, but the greater space and quicker defence tested our structures and showed, at this level, that the individual efforts need to support the team structures. This was reflected in the score line as the Cannons were able to break free and kick goals, whereas the Cats spent long periods camped in the opposition forward line, unable to find a clear path to goal. Final scores – Canada Bay Cannons 6-2-38 d Lane Cove Cats 3-10-28. Goal Scorers – Armstrong, Dorahy & Griebel. Player’s Player – Armstrong & Halloran.